Spain is filled with amazing cities. Here are the Spanish cities you should visit on your next trip to Spain. Perhaps I am biased because I lived here for six months, but the Spanish capital of Madrid is one of the nicest, most authentic cities in Spain. Being the third largest city in Europe, Madrid is filled with tons of activities, restaurants, and culture. 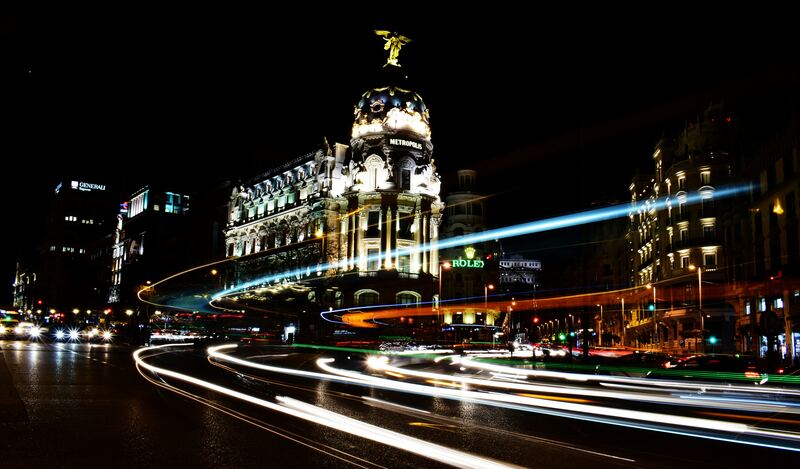 It also offers some of the best nightlife in the world; visit the 7 story club, Teatro Kapital, or go bar hopping around some of Madrid’s cozy cocktail and shots bars. 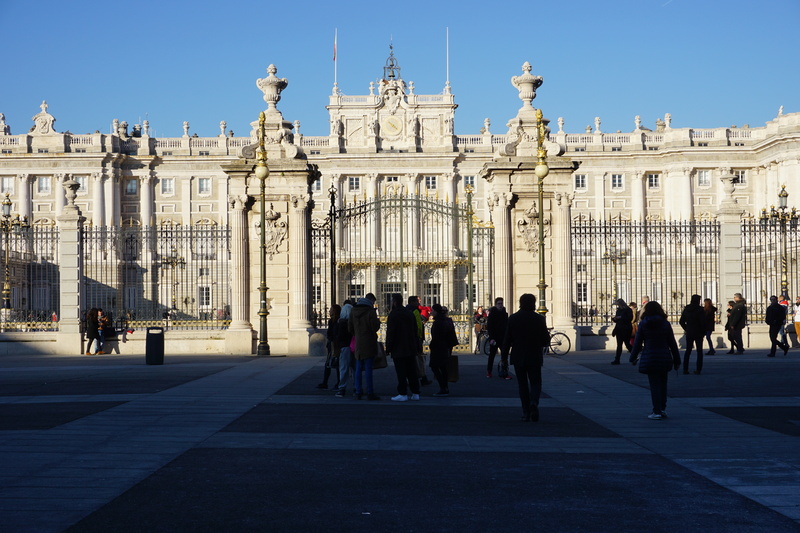 If you want to spend a few days in Madrid during your next Spain trip, check out my “One Weekend In Madrid” travel guide HERE! 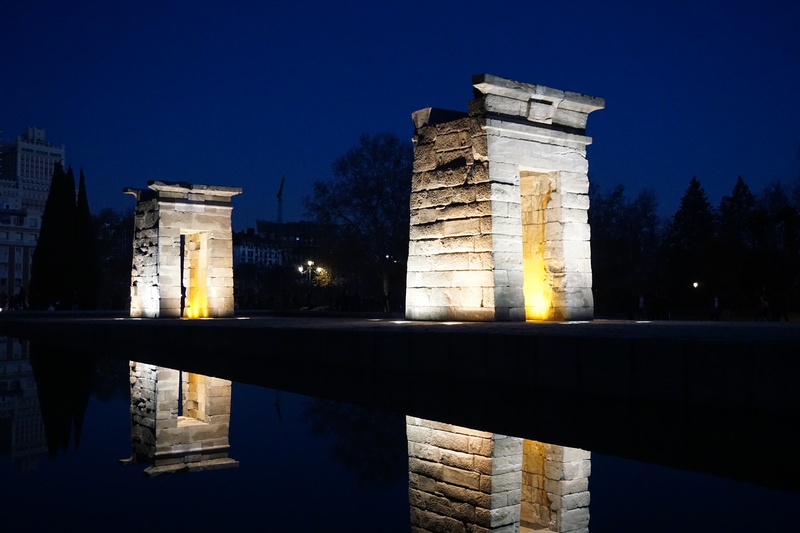 Templo de Debod, an Egyptian temple that was gifted to Madrid in 1968. The Famous Metropolis of Madrid building at night. The Vega Brothers have a great video on San Sebastian, which you can watch here. 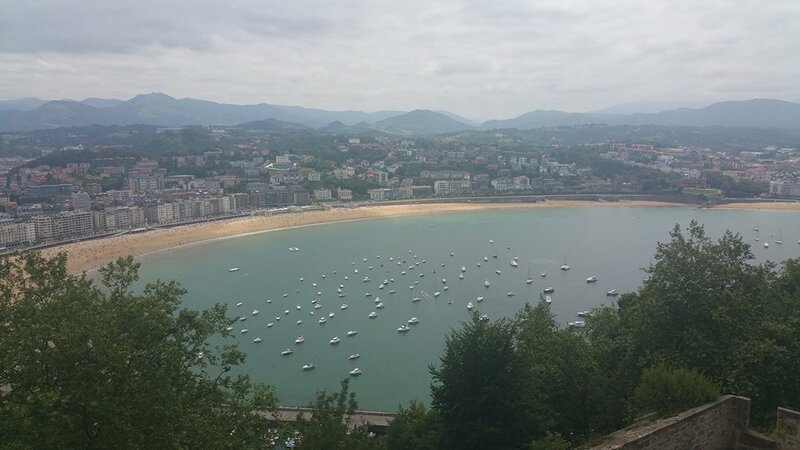 View of Playa de La Concha in San Sebastian, Spain. 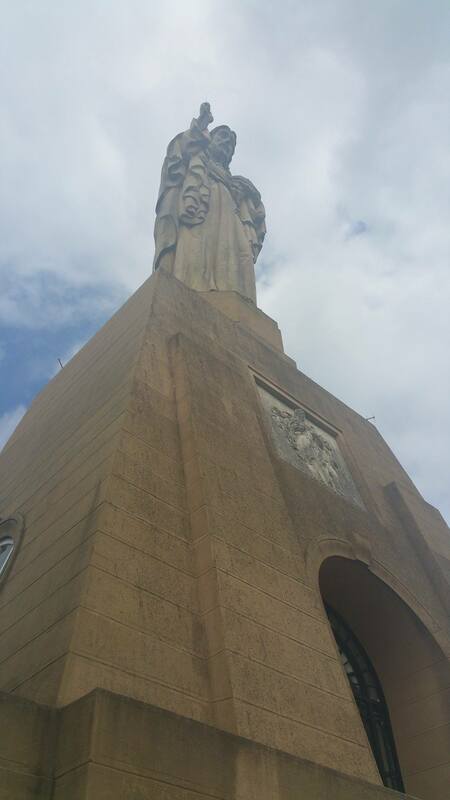 The Jesus statue that sits on top of Monte Urgull in San Sebastian. 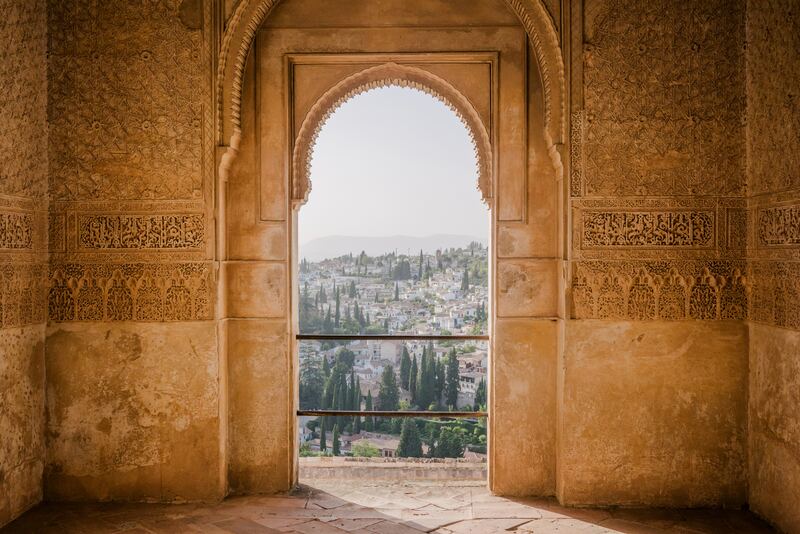 This Andalusian Gem offers Spain’s most popular site- the Alhambra, an ancient Moorish palace. The Alhambra alone is a reason to pay a visit to Granada; just be sure to book tickets far enough in advanced, as it sells out rapidly. I was lucky enough to find an open tour group just one day in advanced. However, if you plan on visiting in summer, it is best to book tours and tickets a whopping three months prior to your trip. Visit el Mirador de San Nicolas to view one of the best sunsets in Europe, and get a great view of the Alhambra. You can also go skiing on the Sierra Nevada, and hike up the gypsy mountain-cave neighborhood, Sacromonte. Oh, and be sure to get some of the best churros in Spain at Gran Café Bib-Rambla. View from the Alhambra in Granada. One of the best places to visit in Spain. 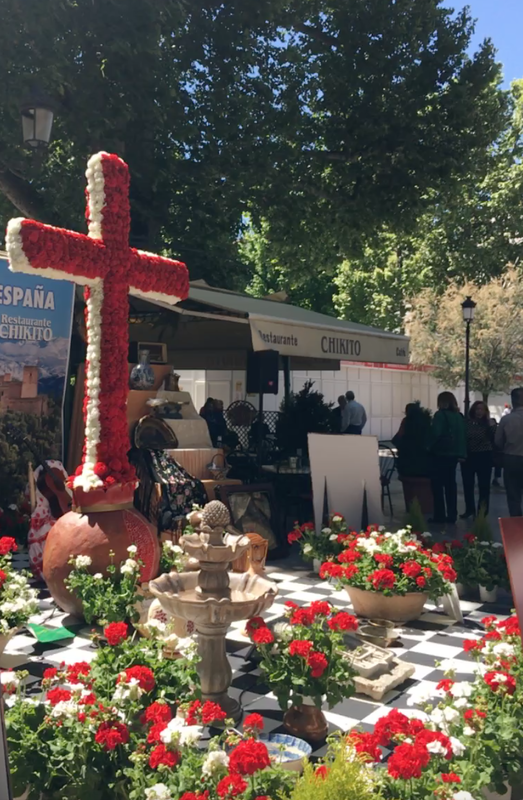 Typical cross from Dia de La Cruz in Granada, Spain. This occurs every third of May. 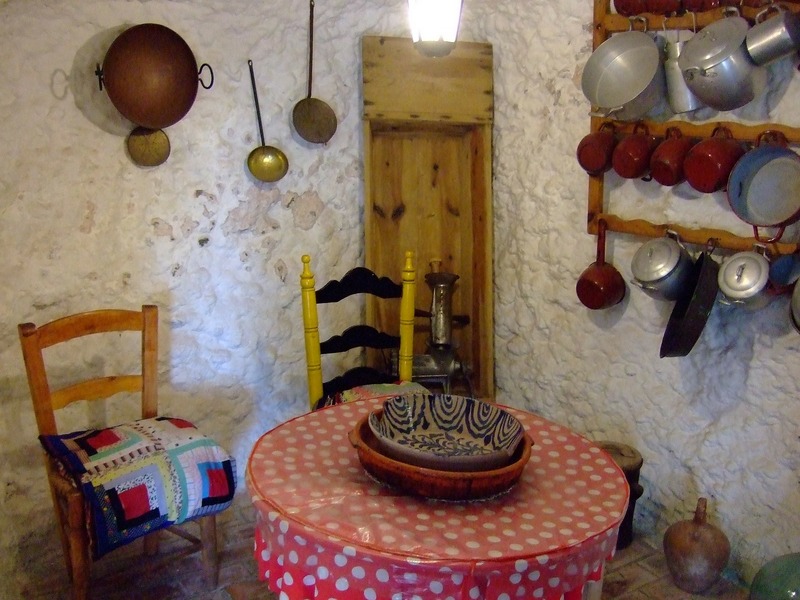 Typical cave home in Sacromonte, Granada. Cuisine, Sunny Beaches, Art… Valencia is a culturally and historically rich city, located on the eastern coast of Spain. In my opinion, Valencia is one of the most interesting Spanish cities. It contains the ultra-modern City of Arts and Sciences, which includes the largest aquarium in Europe, an interactive science museum, futuristic statues, and more! You can also take a stroll in the old town, which has great restaurants, cathedrals, museums, and shops. Make sure you get PAELLA!!! This Spanish rice dish is typical of Valencia, and you can get some of Spain’s best paella here. City of Arts and Sciences, Valencia , Spain. 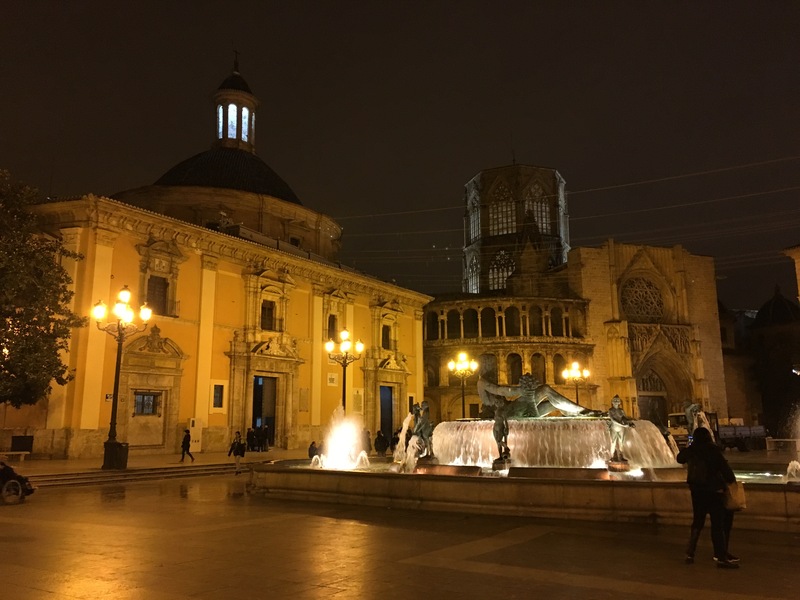 Plaza de La Virgen in Valencia at night. The Royal Garden of Valencia, Spain. Who could leave out Barcelona? Probably the most popular of Spanish cities, Barcelona is one of the best holiday destinations in Spain. Sure, it can get packed with tourists, especially during the summer months, but it is a tourist destination for good reason. 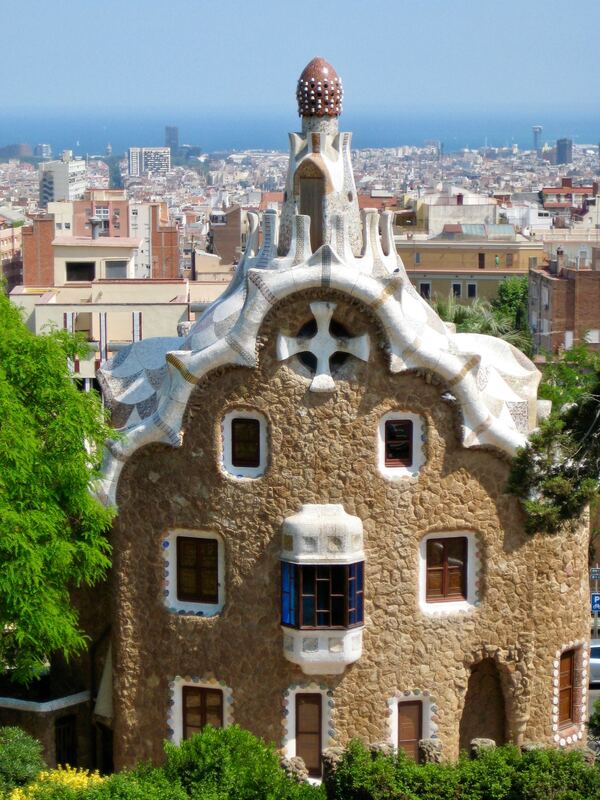 Visit Guadi’s Sagrada Famila and Park Güell, which are some of the most famous- and most photogenic- places in Spain. Eat some amazing tapas with cava (Spanish sparkling wine) to experience Barcelona like a native. I recommend La Xampanyeria, which is a typical Barcelonian tapas bar that has some of the best food and wine in Barcelona. From Park Guell, one of the most famous places in Spain. 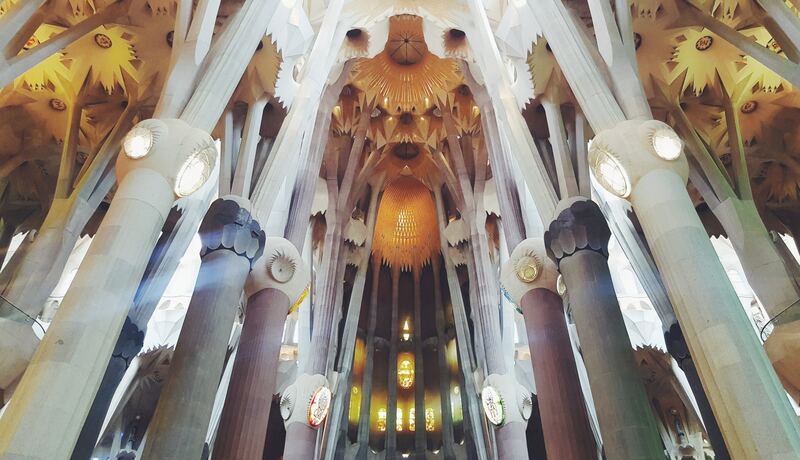 Inside view of the Sagrada Familia in Barcelona. Spain is just beautiful and you are lucky to have traveled to some of these cities. 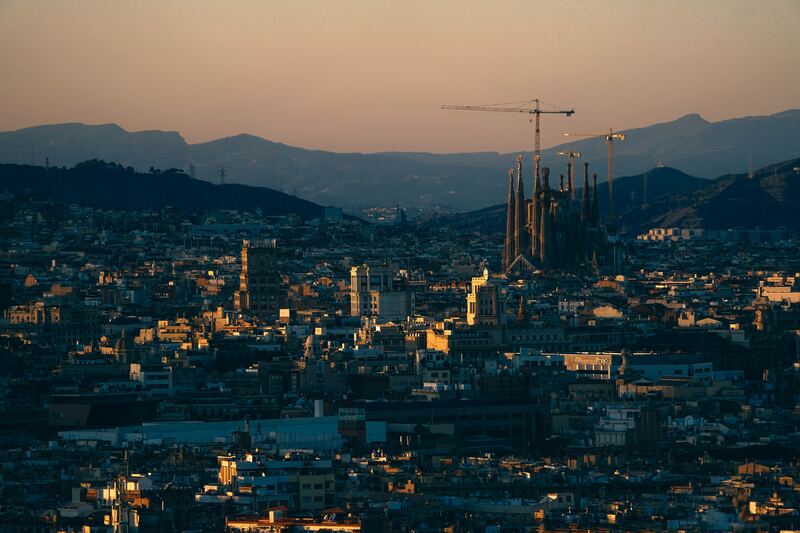 Barcelona is number one on my list too, and your photos confirm why. But I’ve always been curious about Valencia too! That museum and its architecture is breathtaking! Spain is my favorite country. 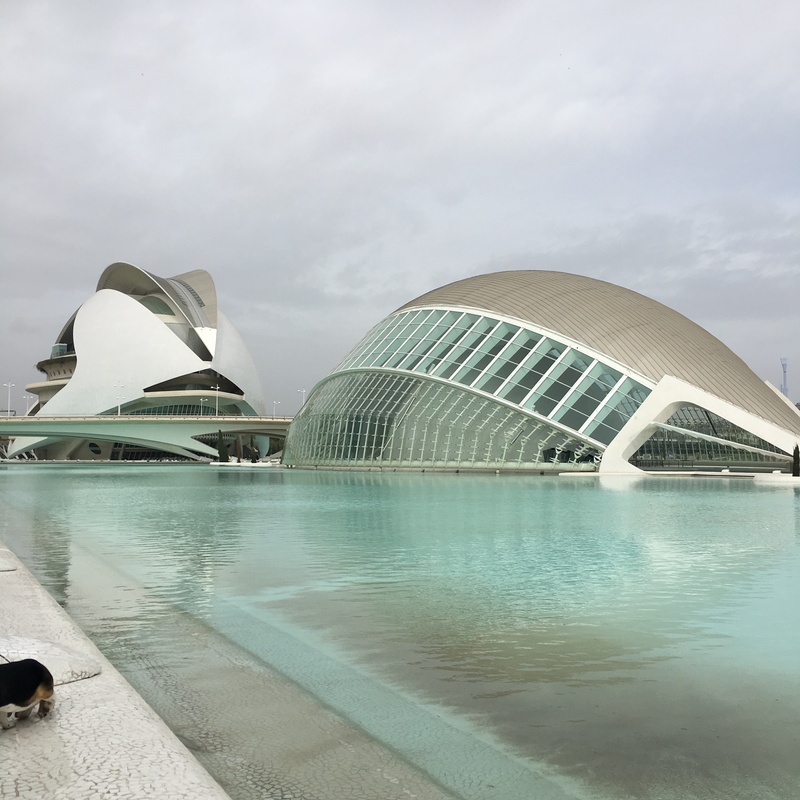 Valencia is such a neat city- you have the historical old town, and then a mile or two away you have this incredible, futuristic “city”! Although ham and pork are heavily used in Spanish food, there are so many amazing dishes that are completely vegetarian or made with different types of meat! Granada is beautiful. Your’e welcome, and thank you! Its my type of city too! Thats the only thing that I missed while living in Madrid, a nice waterfront! I can’t believe I live so close to this beautiful country but have never been to these cities… that must change asap! You must visit! Intercontinental flights are pretty cheap to get to Spain. I loved Granada, Seville and Madrid and definitely want to go to Valencia and Barcelona. Have heard so much about Basque country San Sebastian too. Spain is one place which never ceases to surprise! You can easily do Valencia and Barcelona in one trip, as they are only a couple of hours apart. Spain is filled with surprises!! I was JUST in Madrid and LOVED it. I went to Barcelona a few years ago and really loved the art and architecture there. I’ll have to keep these places in mind for my next trip. Some great travel destinations on here! Of these cities, we’ve only been to Madrid… went to Sevilla instead of Granada, but hoping to make it back to Andaluscia for more one day! I’m always so torn on Barcelona, but it sure looks beautiful. Sevilla is a great city too! I was only there for a day, so I didn’t get to know it as well as some other Spanish cities. Barcelona is worth a visit, even though it is a bit touristy. All of these cities look amazing and your photography is beautiful! I *almost* hiked the Camino this fall, but chose to hike in Switzerland instead. I look forward to someday visiting Spain, though! Thank you! I went to Switzerland this past April and loved it. Great hiking places! I have only been to Barcelona from your list, but I now want to visit them all! I love Spain & it’s so close to me, I need to make these new trips! This was a interesting post to read. 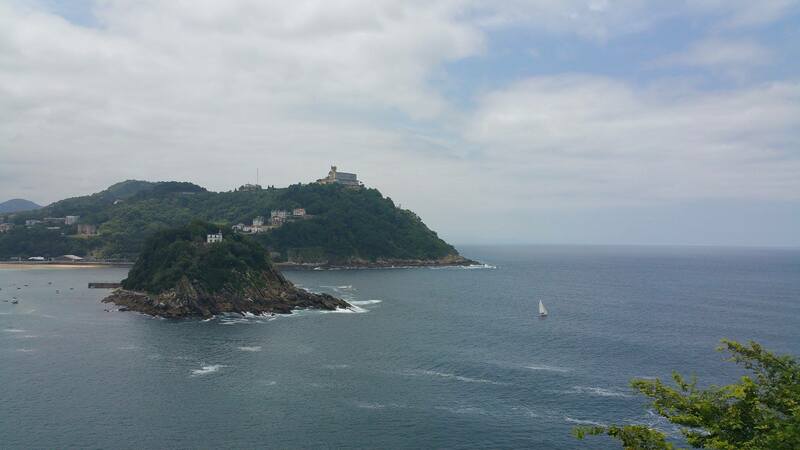 Of the five cities you have mentioned, I would probably want to visit San Sebastian the most for its hiking. The other city that I have heard a lot about is Seville but this did not make this list as we all have our own favorites. Lovely informative post. San Sebastian is so beautiful. 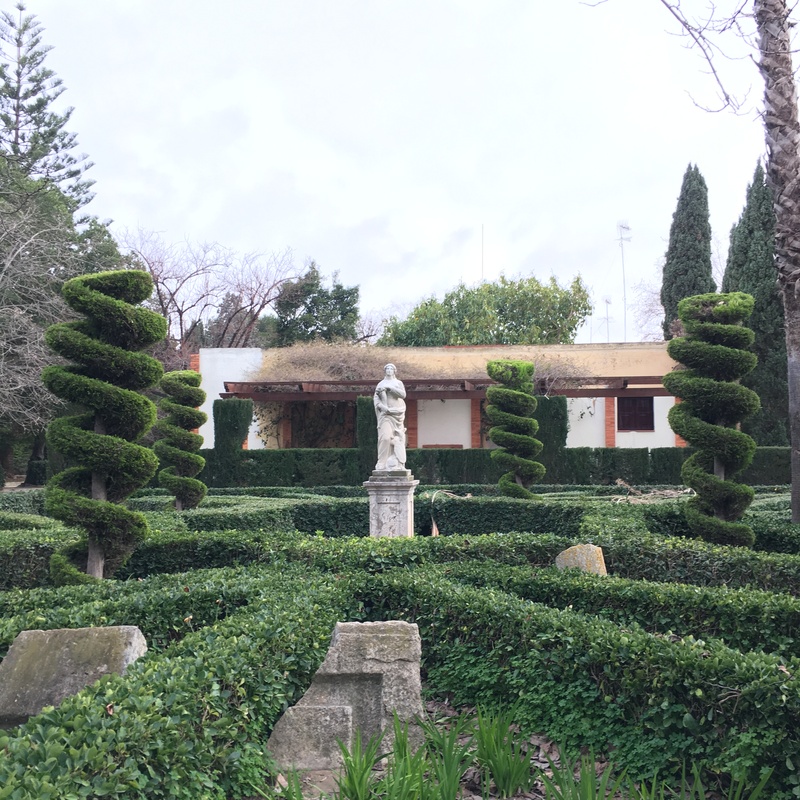 I really did enjoy Sevilla, but I didn’t have enough time to truly experience the city. Plus, My friend from Granada always says “Cordoba and Granada are better!” Haha! ALWAYS wanted to go to Spain and hopefully planning on going there sometime soon!!! Because of your post, I now want to see San Sebastian and Valencia! I wonder about the affordability in staying there long term? Hi Ressa! San Sebastian and Valencia are a favorite among many. Maybe you could rent out an Air BnB? I did that for my weekend stays there, and it would pretty cheap. Yes for sure! They are truly amazing places to see. Wonderful write up of these cities. My family hosted an exchange student from Barcelona when I was in high school, and although I’ve traveled throughout Europe, I’ve never been to Spain. I would love to visit, and I think I’d want to spend time in the different regions, because I’ve heard they vary so much. Thanks for the information! Thanks Meg! That’s really interesting, I’m sure you learned a little about the Barcelona culture while she was living with you! Its true, Spain is so diverse, it almost feels like each region is a totally different country!! Spain is my favourite country. From your five cities I missed San Sebastain as it was in north and I was running out of time, so I did Seville. Very correct Barcelona is favorite amongst tourists for famous Park Guella and tapas. Beautiful information of Spainish cities. So far with Spain I only have family vacations to Gran Canaria as a kid to go by, so the amazing culture, food and history is all a mystery of me. Cities like Madrid and Barcelona look like a lot of fun, really wanna get there sooooooon! I went to Tenerife- we stayed in the south, and it was mostly British culture!! These cities are so rich in culture. You would love them!!! From the list of five cities in Spain I must visit I have only visited Barcelona and Madrid. I am visiting San Sebastian this fall so it was good to get a sneak preview of it here and I hope to get better weather than you got! I didn’t know it was the capital of culture in Europe last year. Another place I want to visit in Valencia, I hope one day to be able to visit and photograph the Arts and Sciene museum. You will love San Sebastian. Its a lot of people’s favorite city in Spain! I hope you do get better weather- however the rain did help cool it down a little. Valencia is lovely! I wish I had brought my better camera with me so I could shoot more at the city of arts and sciences. Thank you! I love the pueblos too. Cueca was one of my favorites. Your list on must visit Spanish cities is right on point! I have visited Madrid, Valencia, and Barcelona, but yet to visit the rest two. I love all three cities, they are all so unique in their own ways, full of history, stunning architecture and the lively Spanish culture. Barcelona is one of my favourite among all, especially for Gaudi’s masterpieces. Thanks Suma! They really are different. Spain is great because it has so many different cultures in one country. I’d love to see the Sagrada Familia after its finished. I have been researching a log about Spain off late as I am planning a trip here soon. Madrid is of course on top of the mind for the reasons you mentioned here. For a first timer like me Barcelona is also on cards. But I had not heard of the other 3 cities. San Sebastián sounds interesting. North of Spain sounds so much like North of India, my country. I am an outdoor person and I think I would love San Sebastián for the Treks and hikes it offers. Barcelona and Madrid are musts for a fist time in Spain. San Sebastian is one of the nicest cities that not as many people know about. If you get the chance, you should make a trip there. Its a 5 hour bus ride from Madrid. Thanks Janine! Valencia was one of my favorites. It also holds a special place in my heart, as it was the very first place I ever solo travelled to. I would love to road trip Spain! Mostly, I’d love to see the landscape there, but these cities would have to be on the list as well. Thats something I would love as well- I only travelled with trains and busses, which are great, but theres something so relaxing about a good road trip. I am going to Barcelona in October but I wish I had more time because I would love to check all these other cities out! Oh well, it looks like I’m going to have to make a return trip to Spain! You should really check out Girona, its so close to Barcelona and it makes a great day trip. All gorgeous choices, although it’s been a long time since I went to San Sebastian and Granada. My other favourite is Cadiz, with the city almost surrounded by water. Cadiz is beautiful. I went for carnival, so I didn’t really experience the city as much as I would have liked, it was all about the festival haha. You didn’t list my favourite city – Seville – but I’ll forgive you because you have included Valencia which I also love. 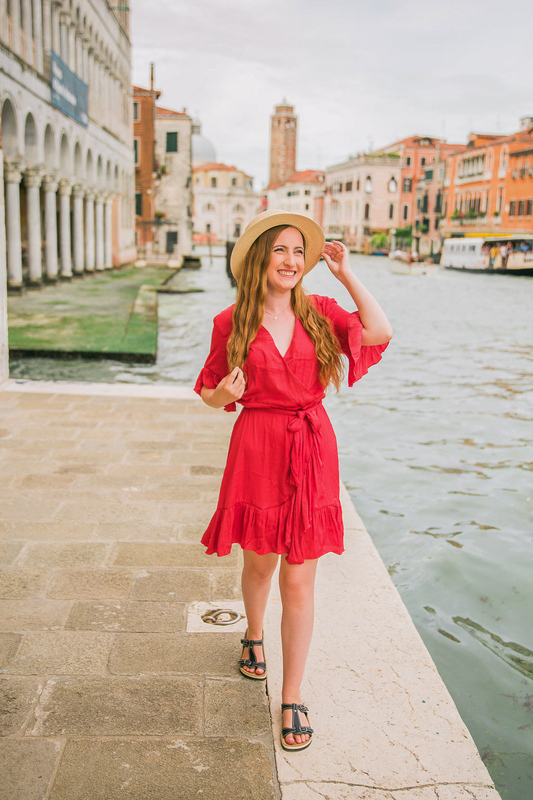 I enjoyed the rundown of your five favourites, none of which could be excluded from anyone’s list of places to visit in Spain, one of my favourite countries. I loved Seville too. Unfortunately, I didn’t get the chance to spend enough time there to really become acquainted with the city. The Alcazar was amazing! I’m happy you enjoyed it, thank you! !